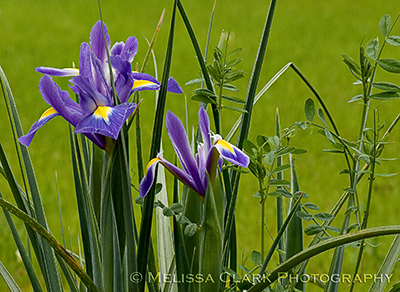 This time of year, landscapes here are a riot of color. In my garden, the dogwoods are blooming, the azaleas are ablaze, hydrangeas are leafing out in the richest of greens, and new leaves are appearing on my beloved skimmia that survived Snowmaggedon on my front hill. One of the few types of plant I inherited from the previous owner of my house that still survive (we won’t speak of the hybrid tea roses that formerly “graced” my western border) are herbaceous peonies (Paeonia lactiflora) in shades that range from white (‘Festiva Maxima,’ I think) to pink and purplish-pink. They are long-lived and I adore them. Occasionally I feed them a dose of Epsom salts in the fall if I remember, in order to promote even more prolific spring blooms. A "bomb-type" pink herbaceous peony in my garden blooming next to Festuca 'Elijah Blue'. 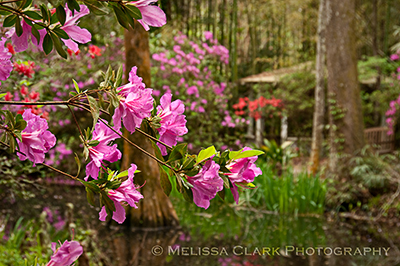 © Melissa Clark Photography. All rights reserved. 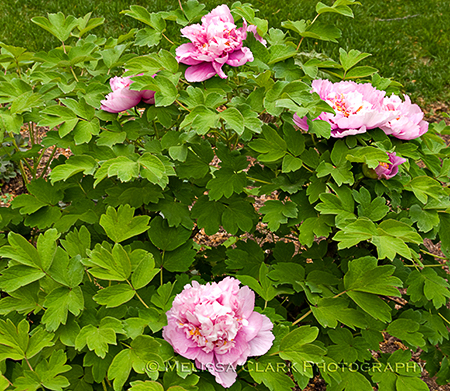 But when I became a plant fanatic, in my early days as a gardener, I discovered tree peonies (Paeonia suffruticosa). They are the national flower of China (once grown exclusively by the emperor), and are shrubby with woody stems. Slow growing but enduring, they may live over 100 years, taking decades to reach three to five feet in height. 'Colored Painting' in bloom near my deck. 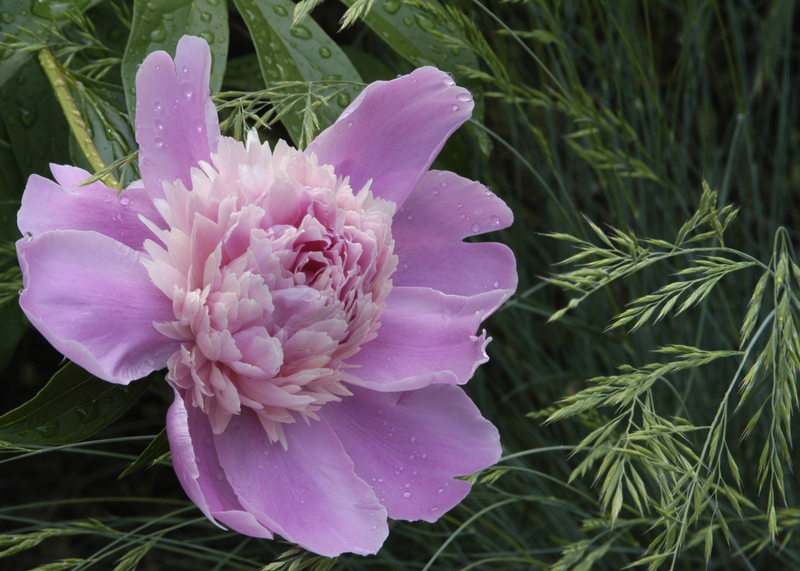 The other, with a slightly more complicated moniker, is ‘Grand Duke Dressed in Purple and Blue.’ Kasha Furman, one of the owners of Cricket Hill Garden, the source for these two peonies of mine, says that in China this variety’s bloom color is in fact more purple-blue than what you see below. She thinks it has to do with soil pH. Whatever. I have no complaints! 'Grand Duke' has a compact, bushy habit, ideal for the smaller garden. 'Grand Duke' has lush, showy blooms reminiscent of a rose. 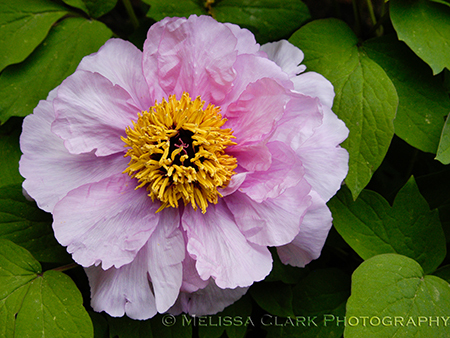 As a photographer, I love photographing tree peonies in bloom. Here are two from a client’s garden a couple of years ago. 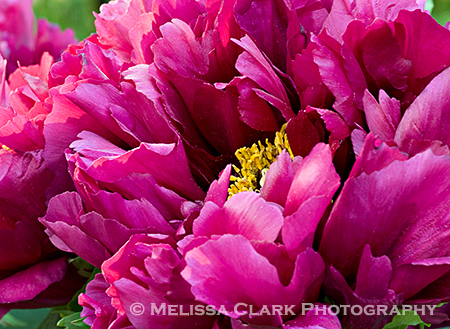 A purple-red hued tree peony in a client's garden in Maryland. 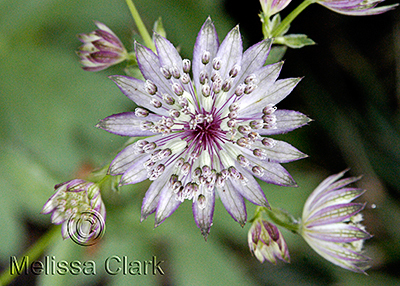 And here is my favorite photograph, of an unknown pink cultivar. 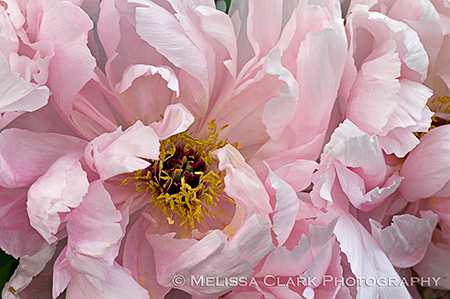 A luscious pink tree peony whose petals draw you in. Alas, the blooms are fleeting. But they are so captivating, so sumptuous, that I find them irresistible. And although I have no photos of other-colored cultivars, they come in yellows, purple, maroon and green – colors rarely seen in their herbaceous cousins. Both single and double-flowered varieties are available. 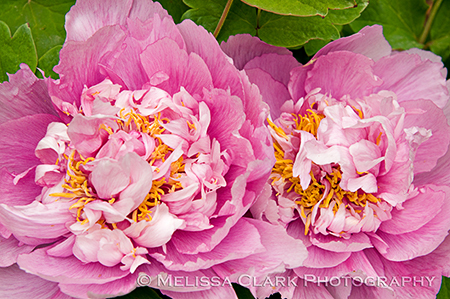 You need to be a bit patient and willing to splurge – tree peonies are expensive and may take a few years to establish. But as harbingers of spring, they are unsurpassed. Think about adding some to your semi-shady garden. You won’t be disappointed. I’ve enjoyed reading several posts in the last couple of months about Sissinghurst Garden, Vita Sackville-West’s famous creation in Kent. 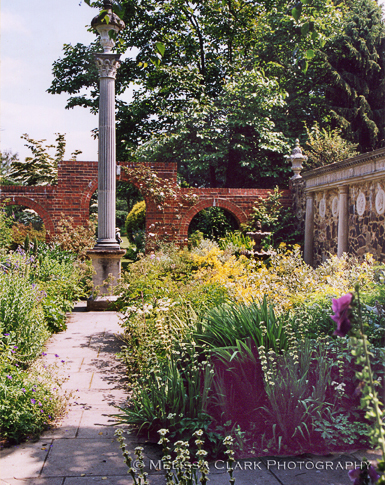 It was among those that I visited on my tour of English gardens in 2003, and one I will always remember. Another Kent garden, however, has an equally special place in my heart although it may not have Sissinghurst’s instant name recognition. Begun in 1957, Great Comp Garden is the seven-acre creation of Joy and Roderick Cameron. Since Mr. Cameron’s death in November 2009, Great Comp is now under the care of a curator, William Dyson and is open to the public daily. 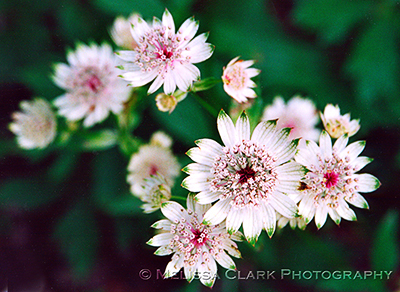 I will always remember Great Comp because it was there that I discovered one of my favorite perennials, Astrantia major. It’s a wonderful plant for shade and although it prefers sites that stay on the cool side during the summer, I’ve managed to grow both the species (below) and several cultivars in my mid-Atlantic garden. It’s a real beauty. There is a tremendous amount to take in at this garden. As he built the garden, Mr. Cameron unearthed quantities of stone and brick. Being inventive, handy, and clearly recognizing the value of having a home-made ruin or two to catch the visitor’s eye, Cameron incorporated hardscape treasures in various parts of the garden, such as this walled “Italian Garden” where I took lots of photos. The "Italian Garden" at Great Comp, complete with an obelisk and hand-build brick and stone walls. I didn’t cover anywhere near the seven acres of the garden, but I found my way into both sunny and shady spots. Great Comp' s design shows the wide variety of greens that provide interest in shade. 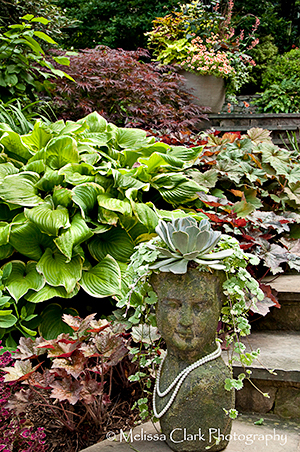 A sunny terrace at Great Comp showcases the superb plantsmanship of its creators. 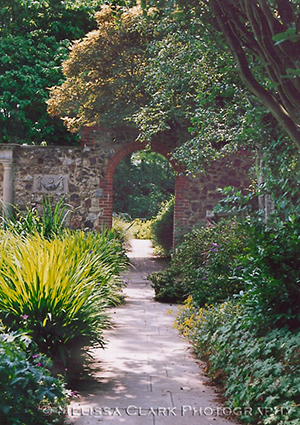 If you’re planning a visit to see English gardens, don’t miss Sissinghurst, of course. But add Great Comp to your itinerary. You won’t be sorry. 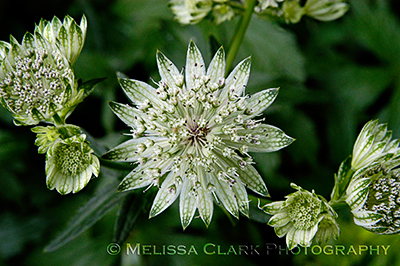 And think about adding some Astrantias to your garden. Here are some you can find in my shady back yard – and every time I see them, I think of Great Comp. Stann Garden, 2009 Open Days tour, Chevy Chase MD. 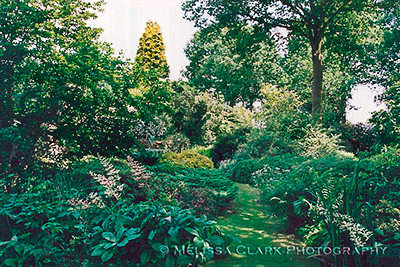 Last fall I joined four other women – all passionate gardeners and/or landscape designers – as part of the DC Area Garden Conservancy Open Days Committee, to find wonderful private gardens for the 2010 Open Days tour here. 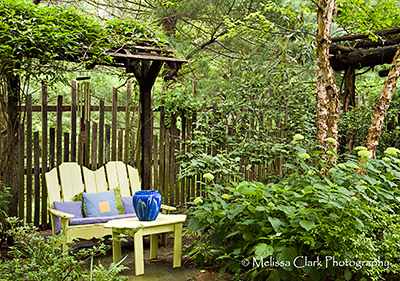 I was inspired to volunteer my time because the Conservancy has had a special place in my heart ever since I first visited my first Open Days garden in Arlington VA in 2005 – and because the 2009 Open Days gardens in our area had been so stunning to visit (and photograph). 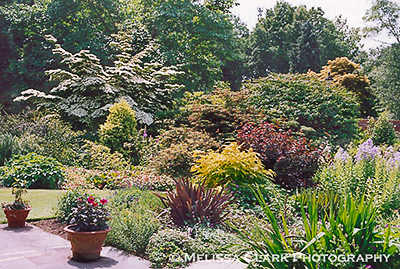 The photo above is from the garden of Jeff Stann, a friend and fellow designer in Chevy Chase, MD. 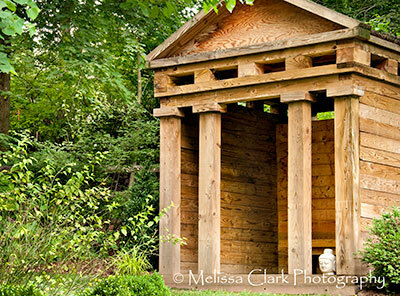 It had been featured in an article in the Washington Post because of its inclusion of a small “temple” built by Jeff at the rear of the lot, inspired by Prince Charles’ temple in his garden at Highgrove. A "temple" that also serves as a garden shed crowns the garden of Jeffrey Stann, open during the 2009 Open Days tour. The garden was full of unusual plants and vistas. But what caught my eye as a photographer was what you see at the beginning of the post, a “rear view” of a seating area nestled in the middle of the garden. 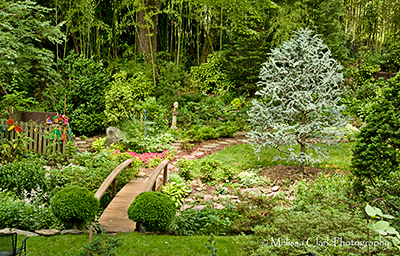 In another Chevy Chase garden (also featured in the Post at a later date), the 80-something owner greeted visitors at the top of a beautiful garden with a bridge over a stream and many sculptures she had created herself placed throughout the garden. Her gardener, a longtime friend and horticulturist, was also present to answer questions about some of the more unusual plants we saw. I took notes for a client’s shady garden on a creeping groundcover that turned out to be a perennial form of Laurentia (blue star creeper). The Williams garden was full of sculpture and artfully pruned trees, including what appeared to be a stunning blue spruce in the lower garden. I didn’t visit all the gardens (there were 18 in all , spaced over 3 Saturdays) although now I wish I had. Two of the others I stopped by were that of Gay Barclay in Potomac, and my personal favorite, Barbara Katz’s garden in Bethesda. Both are trained as landscape designers. 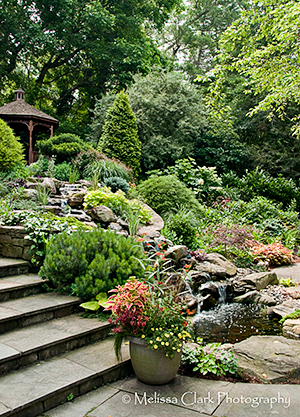 Barclay’s garden, significant portions of which were designed by Sandra Clinton, has been featured in many magazine articles, and has an outdoor kitchen and dining area as well as herb and vegetable gardens and large areas for composting. 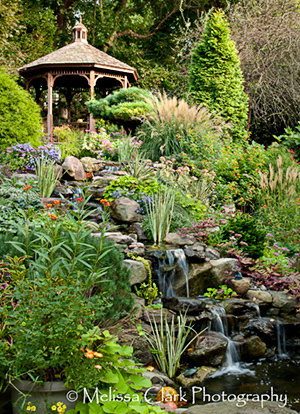 The Barclay garden welcomes visitors on an Open Days tour in 2009 in Potomac, MD. Katz’s garden, which she originally designed for a client who later moved to Boston, is smaller, but breathtaking. Although it was on view in June, it shines even brighter in the fall. Eventually, it may be on a fall Open Days tour, although not in 2010. Here are some photographs I was lucky enough to take in both seasons. The Katz Garden in spring, on the 2009 Open Days tour. The same view, in fall. Spring plantings and a bust with pearls in the Katz garden. 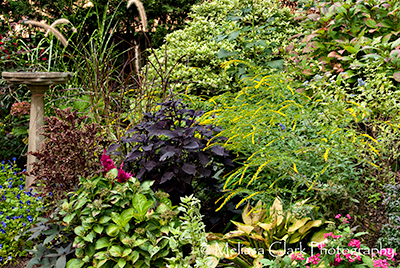 Fall plantings in a mixed border in the Katz garden. This year’s gardens for our area are equally varied and fascinating. Closer to May 22nd (mark your calendars! ), I’ll have a sneak peak for you at some of them. In the meantime, check out the Open Days schedule and sign up for information about gardens that will be open near you (or within driving distance). My fantasy for retirement is to visit Open Days gardens all over the country, camera in hand! The second day of our photo workshop in Charleston, our intrepid leaders took us to Magnolia Plantation & Gardens, providing access before the official opening time of 8 a.m. for the public. As landscape photographers know, being able to photograph around sunrise and sunset is crucial to capturing images in what is called the “sweet light.” Mid-day sunlight is harsh (as witnessed by my struggles with the pictures I took at Middleton Place). 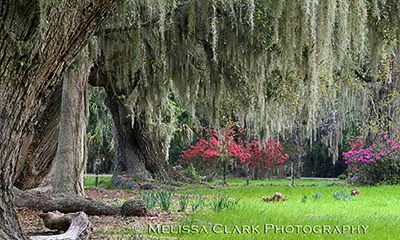 We began by photographing an avenue of live oaks on a deserted road leading into the garden grounds. 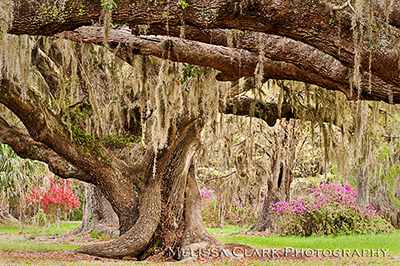 Azaleas provided splashes of color against the gray moss hanging off the gorgeous, huge oaks. I have to confess that having spent almost my entire adult life (except for two years in college) in climates where azaleas are as common as dirt, I have come to take them for granted and dismiss them as uninteresting and overused in the landscape. Imagine my shock, then, to find myself really appreciating their beauty for the first time. We were catching them at their peak bloom, and the effect was stunning throughout the entire trip. 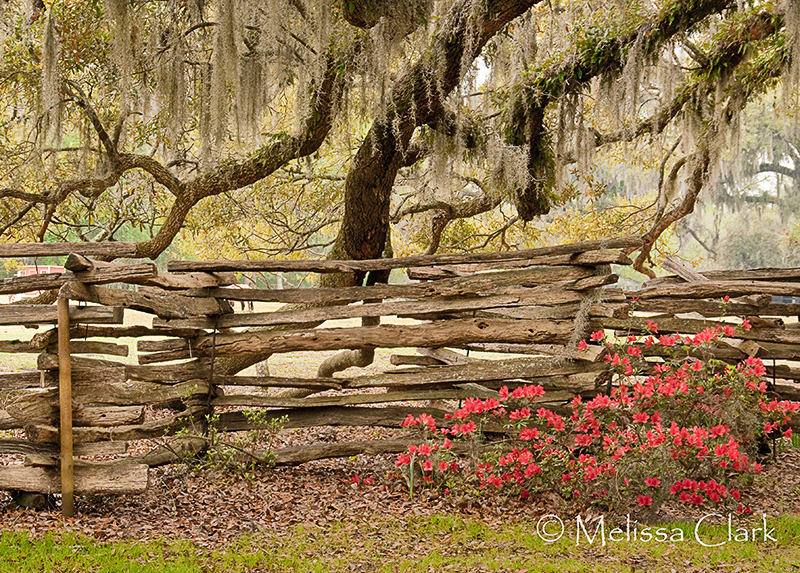 In a hidden part of Magnolia Plantation Gardens, a rose-colored azalea stands out against a small outbuilding in the background. 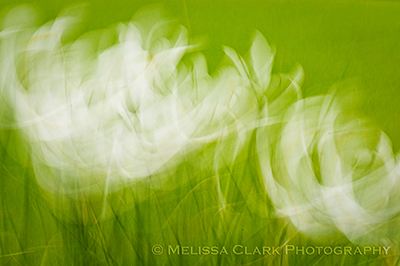 A "swirl" of white Siberian irises, a la Tony Sweet. I will close with two of my favorite photos from the day – one of yet another clutch of azaleas near a fence, and the other of a “catch” at the petting zoo on site. 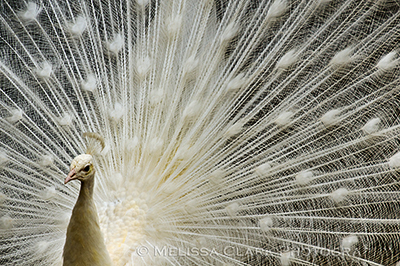 An albino peacock on display at the "petting zoo" enclosure.